On a brisk evening last November, a hundred guests, warmed by drink and noblesse oblige, sipped their wine and micro-brews and listened as Peg Wyant explained how their support could transform the lives of inner-city youth. The event was the grand opening of the nonprofit Cincinnati Squash Academy in Over-the-Rhine and the setting was the Emanuel Community Center’s old gymnasium, dramatically remodeled to accommodate three freshly-lacquered, competition-standard courts and the lofty aspirations of the academy’s cofounder. 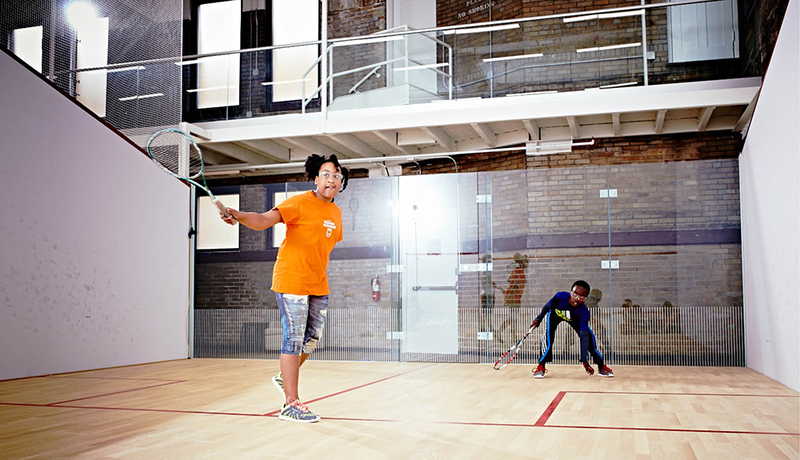 The fresh faces at the Emanuel Community Center in OTR belong to the city’s first urban squashers. Sport as a metaphor for achievement is nothing new. Neither is the notion of using athletics to help at-risk kids succeed. But squash? In OTR? As a reporter for The New York Times wrote when programs popped up in the Bronx and Harlem over a decade ago: “At first blush, squash, with its whiff of the prep school and the country club, might seem a strange choice for enrichment programs for adolescents from some of New York City’s poorest schools.” But urban squash has worked there and in more than a dozen other U.S. cities. Wyant believes it will work here, too. Wyant’s four children learned the game at their country club, and they learned it exceedingly well. All were Ivy League players: Jack and Missy, All-Americans at Princeton; Tim, a four-time All-American at Harvard; Chris, an MVP for Yale. Her brood got bigger last fall with the opening of CSA. The first year was an extended selection process—call it a long rally—to recruit, try out, and consistently engage kids in the demands of a year-round regimen of practice, academics, mentoring, community service, and cultural enrichment that concludes, in a perfect world, with college graduation. This fall there are 35 elementary-age students committed to the rigors of the court and classroom, and CSA will soon be back in schools looking for more. CSA’s goal, according to its mission statement, is to “transform talented students in under-served communities into scholar-athletes, productive citizens, and future leaders with character.” In squash, when you retrieve a difficult shot, it’s a “nice get.” Maybe that’s the simplest way of explaining what CSA is out to achieve—“nice gets” in neighborhoods where too many children are missing the ball. CSA occupies 9,300 square feet (about a third of the space) in the renovated Emanuel Center, which was built in 1871 as a settlement house for German immigrants. Until its sudden closing in 2012, it housed a daycare program and provided recreational, educational, and social services to inner-city neighbors. Today the new tenants include OTR entrepreneurs and the officers of Grandin Properties, whose CEO can keep tabs on the academy’s progeny from her upstairs offices. Wyant stays plugged-in, as well, to CSA’s young, spirited staff. Executive Director Austin Schiff is 25, as is Academic Director and Education Liason Rachael Parker. Squash Director Vir Seth is 24. Over the past year, the trio may have covered the equivalent of a marathon, escorting students from their schools to the center each week, since CSA does not provide transportation. “We walked quite a bit,” says Schiff. “Through snow, sleet, sub-zero temperatures, torrential rain. . . .” It was a trip many of the kids made for nine months before they even received their certificates of enrollment. In his remarks at the grand opening, Schiff promised that CSA would “select the best of the best” from neighborhood schools—public, Catholic, and charter. But, as the St. Xavier High/Vanderbilt U. grad discovered, tempting children with a sport that most of them (and their families) had never heard of proved difficult. Some elementary schools CSA hoped to work with didn’t pan out, and the attempt to enroll teenagers was a demoralizing failure. Schiff visited with seventh- and eighth-graders at Cincinnati Public Schools’s heralded Taft Information Technology High School, making a pitch for the new, exotic sports program just a short walk from Taft’s Ezzard Charles Drive location. Afterward, he and others from CSA waited outside the school to accompany interested students to the Emanuel Center. No one showed up. Ultimately, the staff found success with younger kids—attracting 127 third-, fourth-, and fifth-graders from St. Joseph School, Hays-Porter Elementary, and Cincinnati Hills Christian Academy’s Otto Armleder Education Center on West Ninth Street downtown. Not every fall recruit made it to T-shirt-and-beanie day. Some were cut because of poor attendance or what Schiff termed “iffy” behavior. Some simply failed to take a liking to the game. Attrition is a given, says Tim Wyant. Programs typically recruit more kids than they know they can serve because about half will end up being dismissed or will leave. And that doesn’t even account for the ones who struggled to get to CSA in last winter’s bitter cold. It’s January and she has just returned from a weekend in New York City, where NUSEA board members, staff, students, and alumni from programs around the country celebrated the 20th anniversary of urban squash and a successful $2 million fund-raising campaign. The 800 guests attending the Saturday night gala in the grand ballroom of the Waldorf Astoria Hotel—an event Bloomberg News headlined “Inner City Squash Gets Wall Street Backing”—also received a heavy dose of inspiration. One of the speakers was Reyna Pacheco. Her mother fled their home in Mexico, and Pacheco grew up in San Diego, a poor, illegal immigrant sleeping on floors and sofas. Today, the 4-foot-11 Pacheco, who started to play in the eighth grade, is a senior on the women’s team at Columbia University and a Gates Millennium Scholar. “That’s what we want our story to be,” says Wyant. And in spite of the academy’s struggles to get kids enrolled and keep them coming, she has faith CSA will get there. “And that it’s a totally worthwhile journey,” she adds. Many of the city’s deep pockets seem to agree. Support from United Way, along with donations from Western & Southern and Reds owner Bob Castellini (who’s an honorary board member, as is W&S chairman John Barrett) helped kick-start fund-raising. CSA’s list of major donors is a Who’s Who of local family foundations—Nippert, Smale, Schott, Schiff, Castellini, among them. With a generous first-year budget of $300,000 and another two years of operating capital in the bank, “we’re in a good place,” reports Wyant. In April, the academy held its first CSA Cup, an annual fund-raiser with a silent auction and four teams of supporters playing squash against each other. The auction’s big ticket item: a “24-hour Driving Experience” with a Tesla Model S. The big attraction on the courts: former Bengals linebacker Dhani Jones, who serves on CSA’s board of directors. Jones pursued his opponent’s shots like he was chasing after ballcarriers on Super Bowl Sunday. “The goal,” said fellow board member Harrison Mullin of MVC Capital, who spent his years at Trinity College with a racquet in his hand, “is that all of us will be active—not just in terms of our leadership, guidance, and financial support, but in actual time here at the center with the kids.” Once a squasher, always a squasher. Urban squash originated in Boston in 1995 with SquashBusters, an organization today serving 275 teens and college-age students. It operates with a staff of 20 and a $2 million annual budget. So, if you’re starting a program, who you gonna call? Well, you might begin with SquashBusters founder and CEO Greg Zaff, a former touring pro and Williams College All-American. When CSA’s fledgling staff rounded up their racquets, flyers, videos, and PowerPoints and headed out to the OTR frontier last fall, they may not have known exactly what to expect. But their social confidence and ruggedness had already been put to the test. Schiff and Parker are Teach For America alumni. Seth was a college intern at StreetSquash in Harlem. “The two most trying years of my life,” Schiff says of his TFA assignment, teaching algebra to kids in a failing high school in Greenwood, Mississippi, where some of his students didn’t know their multiplication tables (and—worse—didn’t care). The son of an Indian Hill pediatrician, he now finds himself in the role of Pied Piper for kids from Cincinnati’s inner city, taking them on the uphill trek “to and through” college. Parker is the academy’s data tracker, collecting biographical information on the students, grades from their report cards, scores on diagnostic tests—anything that will be helpful as the staff attempts to identify kids who could benefit from academic support outside the home and their regular classrooms. Last November, I tagged along with the staff as they ushered fourth- and fifth-graders from Hays-Porter to tryouts at CSA. Of the three partner schools, the West End elementary’s students are, by the government’s definition, the most impoverished. The number qualifying for the federal free and reduced lunch program is well above the 70 percent CSA has established as a minimum in targeting schools for partnership. After Hays-Porter let out, the 10 academy recruits (boys and girls) frolicked their way up Ezzard Charles Drive, coats flying open as they walked through the parking lot beside Music Hall and across Washington Park to the Emanuel Center. When, at the entrance, Schiff held up his hand, everyone was still. We walked quietly, single file, through the orange doors and paused in front of the Jasper Johns print on the wall outside the girls’ locker room so the students could slip out of their backpacks and pull out homework, if they had any, to take to the classroom. With Parker, the students sat around tables doing their homework for 30 minutes and then retreated to “College Corner”—a rug on the floor—where for the next half hour she read them a book about Wilma Rudolph’s struggle to overcome polio as a child and they wrote their answers to questions testing their comprehension of the Olympic gold medal sprinter’s inspirational story. Upstairs on the new courts at the Emanuel Center, the Hays-Porter kids laced up their Payless sneakers, put on safety goggles, and grabbed racquets. “It’s important that they are holding the racquet correctly on the first day,” said Seth. “The grip is something I really emphasize. We work on forehands, backhands. Some of these kids have now started hitting rallies.” One fourth-grader, exceedingly pleased with himself, wanted to brag about the number of times he could hit the ball against the front wall without dropping the volley with Seth. Afterward there were jumping jacks, leapfrogs, relay races, and sprints. 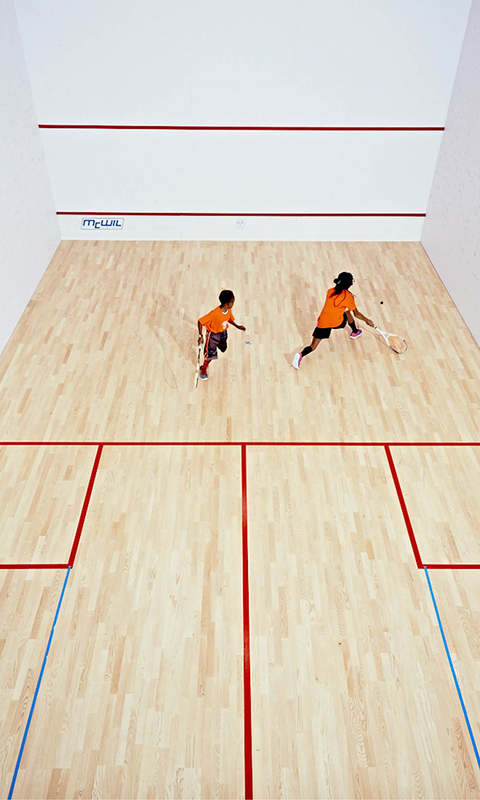 “Seventy-five percent of our time is spent on squash and 25 percent on fitness,” Seth said. Then the session ended as it began, with Schiff standing watch at the back door of the Emanuel Center. Some waited to be picked up by family members. Those who had permission walked home through the gentrifying-but-not-entirely-transformed neighborhood in the fading afternoon. Three Hays-Porter students would achieve Gold Status, joining 15 from St. Joseph (including Ti’Asia and Olivia) and 14 from CHCA (including Madison). Thirteen of the new enrollees are fourth graders this fall, nine are fifth graders, and 10 are sixth graders. Girls outnumber boys, 19 to 13. Seth announced that as many as 15 students would be traveling to Kenyon College in July to compete in the Midwest Urban Championships—students who a year ago had never held a racquet and had to be persuaded, as Schiff recalled, that “squash was not a vegetable or what you do to a cockroach running across the floor.” Parker handed out the June summer camp calendar, with 18 days of practice, a Cincinnati Country Club scrimmage, YMCA camp in Michigan for two students, and a Reds game for everyone. In addition to a certificate, each student received an orange cinch bag and water bottle. Olivia showed her certificate to her mother, asking if she could put it up on the refrigerator door with her other school awards. “Of course you can,” replied April Moorman. It was an event much like any other end-of-the-year sports recognition day. But perhaps what made it different from a Pee-Wee Football banquet or a soccer awards picnic was this: Everyone here seemed to know they were part of something bigger.